Zionist Parachutists - Between 1943 and 1945, the British army Special Operations Executive, in collaboration with the Jewish Agency, sent about 37 specially trained volunteer commandos, mainly Kibbutz and Palmach members into German occupied Europe and Axis satellite states. The Jewish Agency had requested organization of such a force beginning in 1942, but the British only consented to implement the plan in 1943.. The Jewish Agency had envisioned hundreds of air-borne commandos, but the British trained only about 110 and ultimately only about 37 were parachuted into Europe or infiltrated by other means. By the time the British had approved the scheme and implemented it, it was too late to save most of European Jewry, which had been exterminated in the Holocaust. Most of those selected for training had come on Aliya (immigration to Palestine) from the countries they were infiltrating and had intimate knowledge of the area. Left to right: Haim Hermesh, Haviva Reik, Rafi Reiss, Abba Berdichev, and Zvi Ben-Yaakov on their way to liaison with Slovak Partisans. Tri Duby air base, near Banska Bystrica, Slovakia, September 1944. Haim Hermesh was the only one of the five to evade capture and survive the war. 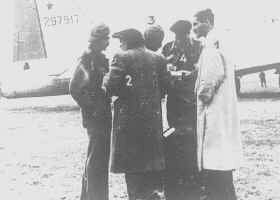 Three of the parachutists infiltrated Hungary including the famous Hannah Senesh, who was caught and shot. Five were parachuted into Axis Slovakia to aid the Slovak national uprising in September 1944. These included Haviva Reik (Chaviva Reich) and four others. Four of these were caught and executed including Haviva Reik. Six operated in northern Italy, including Enzo Sereni who was caught and executed. Ten parachutists served with British liaison missions to the Yugoslav partisans. Nine operated in Rumania, two others in Bulgaria, one in France and another in Austria. The French operative was captured on his seventh mission. In all, the Germans captured 12 and executed 7 of the 37 parachutists sent into occupied Europe. Following the establishment of the State of Israel, remains of the seven parachutists who lost their lives during the war were interred in the National Military Cemetery on Mt. Herzl in Jerusalem.